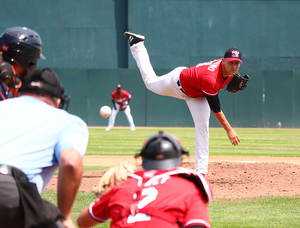 FARGO, N.D. — Michael Tamburino struck out six and gave up just two runs over 5.1 innings in his RedHawks debut and the bats came alive for three home runs as Fargo-Moorhead defeated the Cleburne Railroaders 7-4 on Sunday afternoon. Tamburino, who was acquired by the RedHawks in a trade with Lincoln yesterday, gave up one run each in the second and third innings before shutting down the Cleburne offense the rest of the way. The right-hander gave up eight hits and walked two but got the offensive support he needed to earn his first win as a RedHawk. The RedHawks exploded in the third inning for four runs, including two on a two-run moonshot from Keury De La Cruz — his 10th of the season. Leo Pina also had an RBI triple in the inning. Devan Ahart and Tim Colwell both had home runs of their own in the game — Ahart in the first and Colwell in the seventh — to add on to the RedHawks lead. Fargo-Moorhead ranks second in the American Association with 67 home runs as a team. Fargo-Moorhead finished with seven runs on 12 hits and no errors to earn the victory this afternoon and will look to start a winning streak tomorrow night as the Chicago Dogs visit Newman Outdoor Field for the first time in franchise history. The three-game set with the Dogs begins tomorrow night at 7:02 PM.